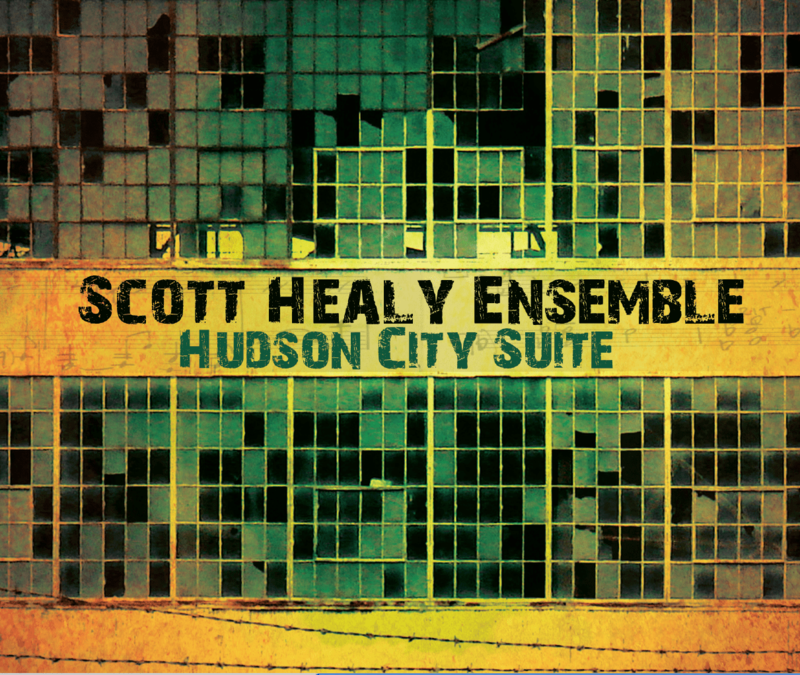 The first time I listened to “Hudson City Suite“, the latest recording from pianist/composer Scott Healy, the music blew me away. Haven’t changed my opinion in the 4+ months the CD has been in rotation but am not sure why this review has taken so long (the word “laziness” comes to mind.) Healy, who worked in Conan O’Brien’s “show” band when he started at NBC and his subsequent move to TBS, admits to being greatly influenced by Duke Ellington. There are moments on the 9 tracks that make up the “..Suite” where one can notice that influence but what is even more noticeable is how good this music and this 11-member ensemble are. Employing mostly Los Angeles-based musicians (with the exception of trumpeter Tim Hagans who plays on 3 tracks), the composer’s “little Big Band” (formally known as the Scott Healy Ensemble) is comprised of 3 trumpets, 2 trombones, 3 saxophones, piano, bass and drums. While the songs have well-constructed melodies and intelligent arrangements, the solos are uniformly fine. Each time Hagans takes the spotlight, he produces a winning solo. On the opening “Transfer“, he rises majestically over the ensemble while on “Summit Avenue Conversation“, he just lets loose over the solid rhythm section of pianist Healy, bassist Carlitos Del Puerto and drummer Bill Wysaske. The cut also features impressive solos from tenor saxophonist Alex Budman and trombonist Andrew Lippman – but the best part might just be the coda that features the saxophone section blowing over the comping” brass. Though it is tempting to talk about (and praise) every track on “Hudson City Suite” (issued on the pianist’s Hudson City label), let me suggest you go find this gem wherever you can (iTunes. Amazon.com, emusic.com). Yes, one can hear the influence of Duke Ellington on the melodies and arrangements of Scott Healy but there is so much more to be heard in the voicings, the counterpoint and the inventive manner in which the composer writes for the sections of his talented ensemble. Positively smashing music – for more information as well as a handsome video devoted to the recording, go to www.hudsoncityrecords.com.